To purchase Stanley Ranch Pinot Noir please click HERE to create an account or log in to My Account if you already have one. Originally planted in the 1870’s, Stanly Ranch is the eastern most vineyard on the Napa side of the Las Carneros appellation. The original vineyard of 300 acres was the first to achieve critical acclaim for Carneros wines when it garnered medals from viticultural fairs sponsored in 1888. Louis M. Martini first purchased Carneros grapes in the 1930s from the Stanly Ranch, a part of which had miraculously survived the phylloxera infestation of the 1880s. In 1942, Martini purchased 200 acres of the Stanly Ranch and six years later he began Pinot Noir & Chardonnay clonal experimentation. COHO has been making a Stanly Ranch Pinot Noir since our first vintage in 2002. We have been fortunate to purchase the oldest existing section of the vineyard that was planted around 1970. 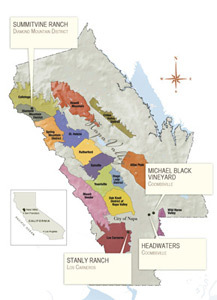 The Pinot Noir clone of this section, originally from Pommard in Burgundy, is named for Louis Martini who identified it during his years of field work as most suitable for the Carneros soils. As this portion of vineyard is going into decline because of age, we began in 2008 incorporating other sections that are planted with Dijon clones. The vineyard sits just above the tidal marshes that flow into San Pablo Bay (which sits above the San Francisco Bay). Most afternoons during the growing season the warm to hot temperatures farther north in the Napa Valley act like a magnet drawing the cool breezes and fog from the bay. These cooling temperatures will began to bring relief to the vines in the afternoon and often not roll out until mid-morning the next day. This cooling blanket creates an ideal environment for the Stanly Ranch Pinot Noir to develop the spicy aromatics and complex black cherry.